I've been on the look out for a pair of sugar gliders and after spending a lot of time researching diet, I've decided on the TPG diet. 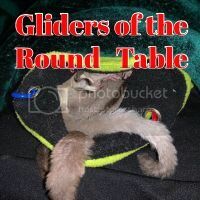 I was considering getting my gliders from www.thepetglider.com but it's been difficult searching for people's experiences from there. My only concern was the sheer amount of gliders they have available. However, I was wondering if they're considered a good source, overall. Priscilla Price has been in business for a very long time, is considered a reputable breeder and many people have gotten their glider/s from her. There are also other reputable breeders who have gotten joeys from her to add to their breeding program. Thanks for the reply. I understand that they're a reputable breeder and that they maintain the database for sugar glider pedigree. I was more wondering if their gliders come socialized since they're such a large operation. Socialized is a general concept when it comes to critters that bond to individuals. Priscilla did introductions and let my four live together before shipping them to me so they were comfortable with each other. I still had to go through the slow process of bonding with them after they came to me. Excellent reply, Hutch. No glider is going to come to you bonded, however, socialized is something completely different. As Hutch pointed out, it is possible to get gliders already socialized as Hutch did. There could still be a few little hiccups once they reach their new homes as they get used to all the new sights, smells and sounds of their new surroundings. The good thing is your new gliders will already be bonded to each other so you won't have to go through the introduction process with them crossing your fingers they like each other. Please don't bring them in with super high expectations they will automatically accept your first glider into the fold. It may take some time and careful introductions. We'll see, I had TPG hold onto the new gliders until January so I can get through the holidays without having THAT on my mind. That also means they don't have to rush neutering them to get them on a plane Thursday. Right now, Nala is curious about Judah but all Judah wants to do is crawl into his pouch. I swapped pouches last night and Nala was sniffing around her "new" pouch, looked over at the main cage to observe Judah. Judah had no hesitation, he just dove into the "his" pouch. Of course, that could also have something to do with the amoxicillin he's been getting twice a day for the past week. At this point, he dives for cover the moment he sees me ("I don't want no more of that nasty stuff!"). I expect to introduce Nala to Judah first so worst case it will be 2 pairs instead of one big colony but we'll see. I ended up ordering two 11 weeks old girls from TPG and couldn't be happier. They arrived obviously very accustomed to people and both allowed various people to pet them after the first day.